I’ve mentioned this before, but it bears repeating – we live in the golden age of investing when it comes to variety of and access to investable assets. Due to ETFs and to some extent, options on ETFs, we can now pretty much invest in any known asset class. Moreover, if there’s some sort of investment class or product which isn’t easily accessible, you can bet that someone is already working on a new ETF in that space. For example, I recently saw a new slew of ETFs have been launched which mimic the behavior of structured notes (kind a cross between bonds and options). The main issue I see with many of the more esoteric ETFs is they usually don’t have an active options chain. Either they don’t list options at all or they are very thinly traded. It does make sense to a certain degree. If the underlying product is complex, then layering options on top of it could be even more confusing. Still, I’ve found some lesser known asset class ETFs which have a surprisingly lively options market. I mentioned emerging market bonds once in a previous article for instance. This time around, I came across a very interesting trading strategy in a regional bank ETF. 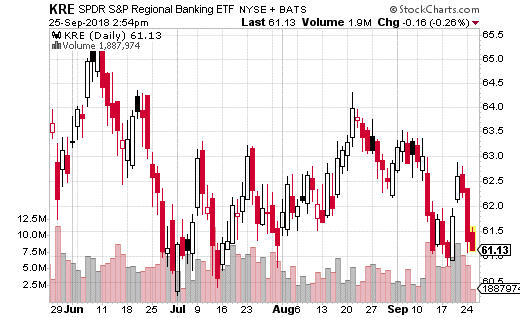 S&P Regional Banks Select Industry Index (NYSE: KRE) is the ETF I’m referring to. You may not think regional banks attract a lot of investor interest, but KRE actually trades over 5 million shares a day on average and even more surprisingly, over 30,000 options. Like I said, ETFs have opened up a whole new world to investors who take the time to research the products. A strategist executed a very interesting 3-way trade, with KRE at $61.25 the December 65-69 call spread was purchased (buying the 65 strike, selling the 69 strike) while at the same time the December 57 puts where sold. The spread traded at several times and prices but filled at least 10,000 times for an average cost of zero – in other words, the credits and debit cancel out. So how does the trade work and what does it imply about regional banks looking ahead? First off, this is an extremely bullish trade for KRE. The stock was close to $61 (at the time of the trade) but the trade doesn’t max out until $69. That’s 13% higher for an ETF that doesn’t tend to move all that much. However, the strategy starts to pay off at any price above $65. From $57 to $65 the trade breaks even (at expiration). The trader is able to get the $57-$65 range for “free” because the credit from the short puts pays off the cost of the 65-69 call spread. On the other hand, below $57, the strategy has unlimited risk. Well, it’s not really unlimited because regional banks aren’t going to zero. Still, in the event of a major selloff, there is a fair amount of risk involved. The strategist clearly believes regional banks are in good shape for the remainder of the year. Not only is there a big bet on KRE’s upside, but there’s an equal sized bet that the ETF isn’t going to crater. This bullishness could be related to the expected increase in interest rates, which is a profit driver for banks. In a nutshell, whoever made this trade is risking millions of dollars to bet that regional banks aren’t going to get crushed for the remainder of 2018… with the opportunity to make millions more if the industry rallies. I love trades like this although financing call spreads with short puts is not something a casual trader should be messing with. Instead, doing a simple call spread is an easy to way to get similar exposure without the risk. For example, you can put on the December 63-67 call spread for about $1. That’s a breakeven point of $64, $1 max risk, and $3 max gain. It’s a cheap, low risk way to get long exposure to KRE. Plus, the breakeven point is only about 4% higher than the current price.